Ontario, Ore., was never really supposed to be home – at least not for many of the city’s recently established refugees who have settled here in increasing numbers since 2017. Most refugees say they were drawn to Malheur County temporarily, by the promise of a notably short Section 8 Housing Choice Voucher waitlist, with intentions of porting, or transferring, their vouchers and moving back later to the bigger cities where they had lived before. The current regulations, last updated by U.S. Department of Housing and Urban Development in September 2015, allow Section 8 rental assistance recipients the ability to move anywhere in the U.S. with their voucher living for a full year in the county where they were awarded the voucher. That county absorbs any increase in cost for up to one year after the move, and then the case is fully transferred and funded by the new housing authority. For people willing to move away from counties with longer waitlists for a while, it offers the chance to receive Section 8 benefits much sooner. 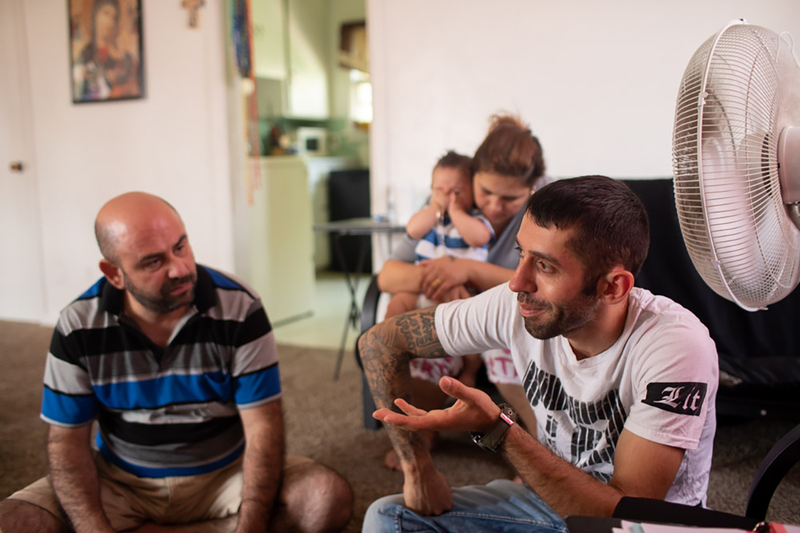 But when the Housing Authority of Malheur and Harney Counties fell into a budgetary deficit in May 2018 and temporarily halted the waitlist, a sense of home for many refugee families became, once again, fleeting and in limbo. Melad Jarjees, 30, lived in Ontario for almost two years before he moved back to California’s San Diego County earlier this month. Jarjees grew up in Mosul, Iraq, but like many refugees worldwide, he faced religious persecution in his hometown and had no other option but to flee for his safety. Through the U.S. Refugee Admission Program, his family awaited resettlement in Turkey for a year and half until placed in San Diego in 2008. The United States’ refugee resettlement program has served over 3.3 million refugees since it was established in 1975, and although the number of refugees admitted per year has fluctuated greatly depending on the political climate, it continues to place tens of thousands of refugees within the U.S. annually. Refugees are people who must leave their home country to evade violence, war and persecution for reasons of religion, race, nationality, political opinion or particular social group memberships. To be eligible for resettlement, prospective refugees must request a case be opened with the U.N. Refugee Agency and undergo a meticulous screening protocol. This process rejects those who pose a threat to others or have committed serious crimes and considers crucial vulnerabilities they experience in their home country such as urgent medical needs or surviving significant violence or torture. Qualified refugees – 53 percent of whom are children – are then considered for resettlement in another country without regard to any personal preferences. Sarmad Elias (left) listens to his brother-in-law, Melad Jarjees, who helps translate for the family. In San Diego, Jarjees spent years working full time at a hospital in a similar role to positions he previously held in Iraq and later Ontario, assisting doctors and nurses with procedural preparation by supplying them with the correct sterile instruments. But his commutes were 90 minutes each way with traffic, and he had to pick up gigs as an Amazon Flex package courier three times per week to make ends meet. That made it even more difficult to spend time at home with his wife, Afrah Jarjees, and their three children, ages 7, 6 and 5. On top of that, he was helping his parents supplement their livelihood. So, at the end of 2016, he decided to provisionally move to Ontario after he met a farmer from Boise, Idaho, who assured him it would be easier for him and his family to get by in Treasure Valley. More importantly, he also learned about the short Section 8 wait time, which he hadn’t been able to utilize in San Diego, although he qualified, due to wait times that exceeded 10 years. Finding adequate housing, however, was a crucial component in determining whether Ontario could be a place to call home. And while the hunt for housing is a process ordinarily stressful for any person, even when searching in the same city, that wasn’t really the case for Jarjees. Renee Cummings, director of the Four Rivers Welcome Center, said community-fueled interactions like Jarjees’ experienced are exactly what she and the volunteers who founded the center earlier this year hope happen for refugees in Ontario more regularly. The Four Rivers Welcome Center, which officially opened as a single-employee organization in May, with Cummings leading the way, provides translation services, assistance with job applications and interviews, and a vital opportunity for recreation and community with other refugee families. 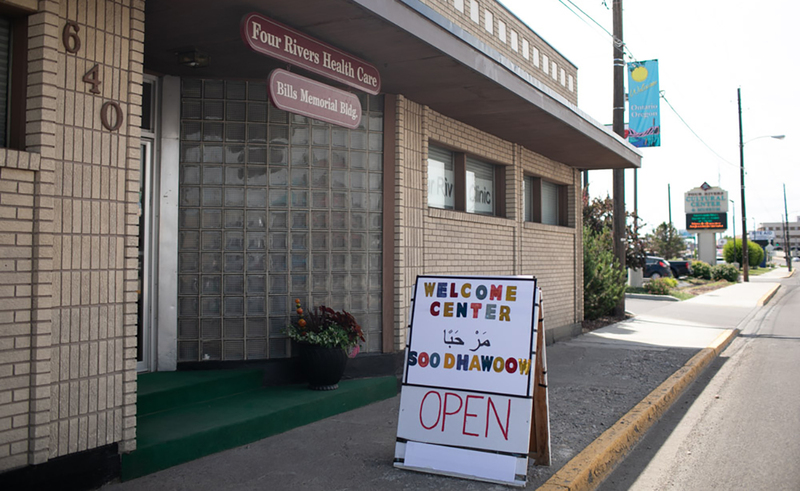 The endeavor was initially funded through a grant application by the Four Rivers Health Care, a free health care clinic primarily serving people without health insurance that offered its lobby to the center. Cummings’ grant covers operations through March 2019. 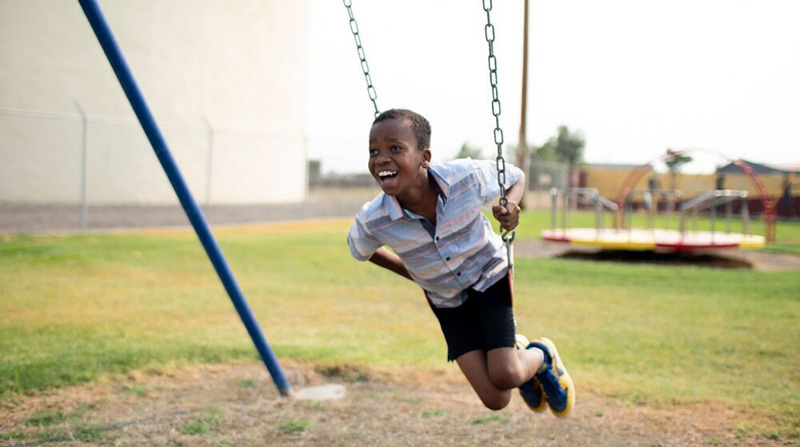 Mudey, age 10, swings outside the Four Rivers Welcome Center in Ontario, Ore. It still looks a bit like a lobby, but Cummings immediately hung up a world map and stocked up on candies and teas from the countries of many refugees’ origin. A desktop computer is open to the public, and three desks nearby are occupied by Cummings and Arabic speakers Ekram Ahmed and Jaafar Raheem. In July, the Welcome Center partnered with Portland-based Immigrant and Refugee Community Organization (IRCO) to further connect with the local refugees and hire part-time and full-time translators directly from the community, until funding lapsed at the end of September. Jarjees was one of four volunteer-turned-employees, and he worked there for about one month. Most of the roughly 50 refugee families in the area have come to Ontario from the towns and cities where they were placed after resettling from Iraq, Somalia and Sudan, but low-income families across the United States continue to move to rural communities, such as Ontario, to receive the rental assistance benefits they qualify for sooner. The waitlist finally reopened earlier this month; it had been closed and new applicants were not being processed for almost half a year. Kristy Rodriguez, Housing Choice Voucher Occupancy specialist at the Housing Authority of Malheur and Harney Counties, said there are approximately 347 households on the waitlist with an expected wait time of about 18 months. While the housing authority no longer has a shortfall, she expects the counties to cycle in and out of shortfall over the next few years as a result of voucher transfers to areas with higher housing costs. With guidance from HUD, the local housing authority has adopted a preference process for Section 8 vouchers to now prioritize Malheur County residents in addition to the existing vulnerable designations, including victims of domestic violence, people with disabilities, and people who are homeless, elderly or veterans. While Jarjees said he enjoyed the slower pace of life and strong sense of community offered by Ontario, the decision to move was motivated by factors beyond his own preferences. While the goal of refugee resettlement programs globally is ultimately to have people move back to their home countries, less than 1 percent of the world’s refugees ever do. The Ontario pit stop will likely last much longer for refugee families interested in leaving but who are new to the waitlist or were recently added. Cummings, who for three years was a housing advocate at local nonprofit Community In Action, expects even more changes. In the meantime, she said, the Welcome Center is here to stay and will offer services to all Ontario residents with open arms. 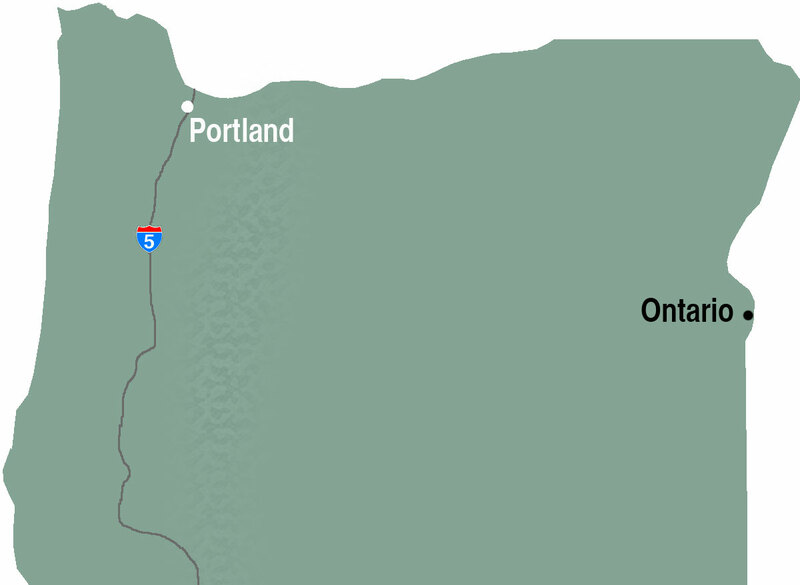 The Four Rivers Welcome Center has become a hub for helping refugees find assistance and resettle in Ontario, Oregon. This article is part of Street Roots’ Housing Rural Oregon series. Street Roots received funding from Meyer Memorial Trust’s Affordable Housing Initiative to develop dedicated reporting on rural housing issues. The goal is to broaden our views around housing policy to promote better understanding of the issues communities face across the state. We also intend to highlight the common ground that we all share, and the solutions we can all get behind.